Ask fellow campers about "MainStay Cottages and RV Park" and nearby attractions. Beautiful and relaxing setting for this small RV park overlooking the water in Winter Harbor. The park has only 10 sites, but the views and the atmosphere are phenomenal. The camp hosts were fantastic and made us feel very welcome. The sites are gravel with grass between the sites and down the small hill to the fire pit area. The park has a small laundry room and their wifi worked. The drive to the main area of Acadia NP is about an hour. See our full reviews and pictures at thegilliamsisland. 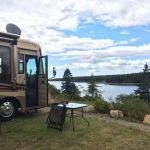 We camped at MainStay Cottages and RV Park in a Motorhome. This is a great little park. Only 10 sites. Some shared hookups which means some sites are back-in and for a motorhome you do not face the water. But the owner allow you to pull in anyway and run your Hookups under the motorhome which is what we did. They noted this situation on phone during the reservation so that we were aware of the situation. Owners were great and provided much information about the town and area. We will return. 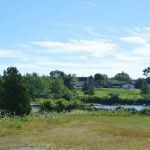 We camped at MainStay Cottages and RV Park in a Motorhome. Winter harbor is a neat little town. The hiking/biking trail in Schoodic portion of Acadia national park are very nice. The onsite owners are wonderful hosts. We stayed here 8 nights in our 35 ft 5th wheel. Stay 8 nights & get the last night free. The Schoodic Peninsula area of Acadia NP is fantastic. There are only 10 sites @ this facility. Communal fire pit. Several of the sites are very close together, but in my opinion the wonderful view of Winter Harbor more than makes up for that. We will return, & we hauled our 5th wheel all the way from north FL! No onsite bathrooms/showers, but there are $4 very nice showers within walking distance, or just use the shower on your RV. We camped at MainStay Cottages and RV Park in a Fifth Wheel. Chases Restaurant (walking distance) is excellent, great breakfast and try the great seafood chowder. Beautiful Bay Views from our site. The park is small and very well maintained. There is both 30 and 50 amp power at each site, WiFi was very fast. The owners are on site and are an excellent source of info. They helped us find some of the most beautiful places to hike; for those who don't hike, the coastal drives are amazing There are many excellent places to eat seafood. We will be back. We camped at MainStay Cottages and RV Park in a Motorhome. The Winter Harbor side of Acadia is far less crowded than the Bar Harbor side there are several Wild Life management areas to explore. Thank you for your kind review. It's always a pleasure to have a guest who's a happy camper! We appreciate your taking the time to review our RV Park and hope that we see you again in the near future. All about location and the view! Some spots are better than others depending on if you are in a motorhome or trailer. Spot 7 in a motorhome was perfect; windshield faced the bay and no neighbor to the right. Two sites use a common connection area so one side of the rv is extremely close to the other, only room to walk between. Not a big deal unless you park reverse for best view; could have your door right next to a rig. Check their site map and if possible work site that is best for your rig. Can't beat the location and view. Quiet. We will gladly stay here again! Wonderful hosts! We camped at MainStay Cottages and RV Park in a Motorhome. This small park gets high marks for a spectacular setting, ideal location for sightseeing, nice level pads and services, free washer and clothesline (solar dryer!) and good wifi. The proprietors are friendly and helpful and take pride in their facility and town. The downsides are: VERY close together sites sharing the same pedestal. We could NOT put out our awning all the way. The way to avoid this is to book early and request a sideview slot rather than a front view one...there are only a couple or so of those but have much more room. I could not get a Verizon data signal at all when the park was weak but fortunately the wifi was mostly solid...and phone reception was spotty. There are no bathroms, no showers, no pool, no swimming, no playground, no clubhouse etc. ....You are buying a well equipped parking spot with solid water, electric, sewer and wifi...and a spectacular water view in a clean and quiet central location. I gave it an 8 for the beauty! We would return. We camped at MainStay Cottages and RV Park in a Motorhome. Definitely take the one way drive down and around the Schoodic section of Acadia park there are several nice stops and beautiful vistas. Several nice restaurants for Maine fare....in town within a long walk...Chases, FishermansGalley, Salt Box. The LobStore on the way into town had great fresh off the boat fish and mussels & clams as well as chowder and lobster to take home and cook. The Grindhouse Smokehouse across the street smokes mussels, clams and fish and cheese to go...excellent. First things first - the owners are absolutely wonderful. They are very friendly (offered me a beer when we showed up), very helpful, and just great to talk to. This is a very simple RV park with just 10 sites, no bathrooms or showers. Great location right on the harbor. We were initially put off by the RV's lined right up close to each other. But, after we set up, sat at the table and chairs supplied, and looked over the harbor during late afternoon, that didn't bother us a bit. Mornings are gorgeous, too, drinking your coffee and watching for eagle and osprey feeding in the harbor. The grounds are very simple, but very well-maintained. The park is walking distance to town and the bar Harbor ferry. The Schoodic section of Acadia NP is just down the street, less than a mile. There is nice bike riding at Schoodic and the Winter Harbor area. What is great is that you are removed from the Bar Harbor nuttiness. The site was level, good 50A power, and big rigs should have no problem. Wi-fi was good, and Verizon service was good. We're looking forward to going back. 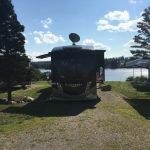 We camped at MainStay Cottages and RV Park in a Travel Trailer. The Bar Harbor ferry is walking distance and saves you a longish drive. Make sure you visit Schoodic Peninsula, too. Thanks for the great review. ...and I do understand that the quarters are tight, but with all the space around and the view, it's easy to forget. Enjoy the rest of your trip and come back to see us again, soon. Great small park overlooking Henry's Cove. If all coaches set up to over look the water. Some will be tight together, but the view is worth it. They have added a washer and as noted they have a solar dryer. Owners live on site and are very helpful. We camped at MainStay Cottages and RV Park in a Motorhome. Try the Warf Gallery and Grill in Corea for lunch. Visit the museum at Rockefeller Hall at Schoodic Point. Slow down and enjoy the the quiet side of Acadia. Great view of Winter Harbor right outside the door. Ample room for any size of RV. This part of the Maine Coast provides an authentic peek at quaint fishing villages while providing a jumping off point to peruse Bar Harbor via ferry (right next door) or a drive (about 1 hour). We preferred this area due to the peaceful surroundings, removed from the hustle and bustle of Bar Harbor. You are minutes away from restaurants, grocery stores, antique shops, and Schoodic Point Acadia National Park. The owners are invested in the property, providing a high level of service and comfortable surroundings--and hey--must mention the free washing with "solar" drying aminities. We loved this place. We camped at MainStay Cottages and RV Park in a Fifth Wheel. Go to Case's restaurant right down the street and order a "Stack" hamburger. So glad you enjoyed your stay with us... enough to wirte a review. We feel special and hope you'll join us again, soon. Wonderful location with beautiful views of the harbour. We enjoyed exploring the nearby village of Winter Harbour. Our hosts were friendly and very gracious. Lovely, peaceful spot. We camped at MainStay Cottages and RV Park in a Travel Trailer. Restaurants, shops and grocery store in Winter Harbour just minutes away. Ferry to Bar Harbor next door. We stayed here for one week, and this campground is the end of our journey north before we head home to Texas. We have to say that this campground was the best we've stayed in during our entire trip. 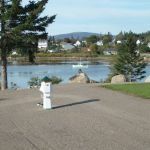 We had 50 amp electricity, water, sewer, and a great view of Henry's Cove, which is an inlet off of the Atlantic Ocean. This campground is small, with only 10 spaces, but every space has a great waterfront view. The owners of MainStay are very courteous and accommodating. One evening they were cooking lobsters for their family, and they offered to add ours to the pot. The owners have lived in this area for many years and are very knowledgeable and helpful of the places to see and the best restaurants. There are no public showers, but we didn't need them. They do have a laundry room with cold water wash (at no charge), and "solar" drying on a clothes line. They offer Wi-Fi to their customers, and it is reliable. We had good Dish satellite reception, and our Verizon phones worked, but not consistently. They are very close to Acadia National Park, which we toured during the day and relaxed at the campground at night. We will stay here if we ever return to Maine and highly recommend it to others. We camped at MainStay Cottages and RV Park in a Motorhome. There is a free bus service that stops at the park and will take you to points of interest in the Gouldsboro area. We took this ride and it is very worthwhile. Also, during low tide, we walked down to the shore and collected sea glass. Winter Harbor have a great 5&10 store, and everything is within walking or biking distance. The spot are close together which could be a problem except the views and area are beautiful I would recommend you try it if in the area. It is on the "Sleepy" side of Acadian National Park and only a few minutes away. It is about an hour to the main site and Bar Harbor. All hookups are new and included in the price. No cable that I was aware of though I did not look or ask. We were too busy. Power is excellent and never gave us a problem. WiFI was very good for us. Not fast but it did never seem to have a problem. The managers are eager to help and keep the place spotless. There is not currently a bathroom or laundry. Roger is trying to work on that. All sites appear to be flat. As opposed to most parks, you'll be asked if you want the view to be out your front window or out your awning. That will depend upon the site and may mean pulling in forward or backing in. All part of the service. 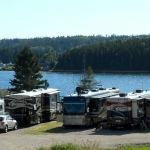 We camped at MainStay Cottages and RV Park in a Motorhome. Please note up front this is a park for self contained campers. They have no rest room facilities. Also children are welcomed but there are no activities or facilities for them. The owners are experienced Inn keepers and have added 10 RV sites. 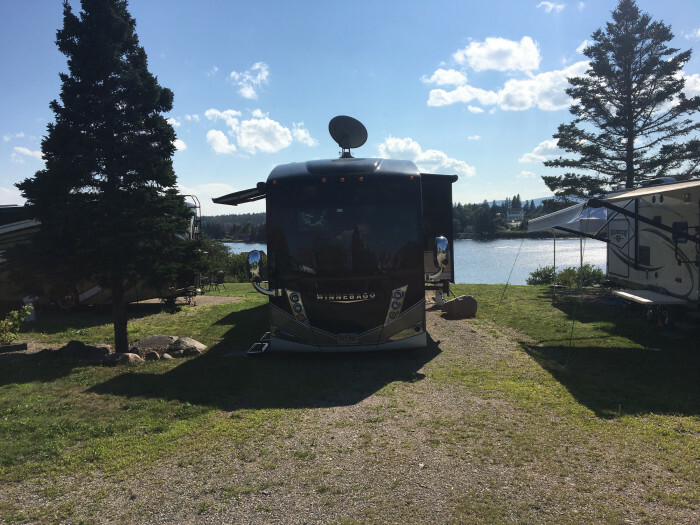 The park overlookS Henry's Cove and is set up so you can back a trailer or drive an RV in, thus you can see the water and rocks from your unit. Note that if you have an RV and all drive in sites taken, then you will have to back in or use a long cord and hose. Very nice tables and chairs are at the sites. Sites and drives are crushed stone and level. The sites are close side by side, but you stay here for the Schoodic Section of Acadia Park and the view. Great small park on the idea of Betty's in Abbeville LA. Here you come for the quiet and the view. We camped at MainStay Cottages and RV Park in a Motorhome. Try the Warf Gallery and Grill in Corea for lunch. Visit the museum at Rockefeller Hall at Schoodic Point. Slow down and enjoy the the quiet side of Acadia. Are you affiliated with MainStay Cottages and RV Park ?